Machesney Park, Illinois – The City of Broken Arrow’s only existing water treatment plant, erected in 1966, could no longer satisfy the needs of the 35,000 homes and businesses, requiring the City to purchase water from other facilities and nearby Tulsa. In cooperation with the Oklahoma Department of Environmental Quality and the Oklahoma Water Resources Board, a new municipal water treatment plant on the shore of the Verdigris River will provide up to 20 MGD (plant rating at 20 degrees C) of water daily to the City of Broken Arrow, Oklahoma. The project began in early 2012 with the bid for the standby power system awarded to Cummins Southern Plains LLC, Tulsa, for the parent company based in Arlington, Texas. The project will utilize three 2 MW generators powered by Tier II emission certified Cummins 16 cylinder QSK 60 series diesel engines. Cummins Southern Plains LLC provided the performance characteristics of the generator sets to Hennig Enclosures Systems, who then provided submittal drawings of the enclosure packages in Solid Works CAD format for the customer to review. Each enclosure measured 40’ long x 10’ wide and nearly 14’ high to allow ample airflow and provide a 25 dba sound reduction. After the customer and contractor approved the drawings, Hennig Enclosure Systems began cutting and bending steel. “Hennig is a one-stop shop. We manufacture the entire enclosure and fuel tank in addition to mounting the genset and landing all the electrical connections for the customer,” Grabowski added. A few weeks after the generator sets arrived at Hennig, the enclosure and fuel tank packages were ready to ship. There were some logistics challenges on this project, as the facility site was in the midst of construction. Delivery was made down a temporary dirt road and the three 2 MW Cummins emergency power generators were set in place without a hitch at the new Broken Arrow Water Treatment facility site. The Broken Arrow municipal water treatment facility is primarily funded by loans totaling $64.8 million, administered by the Oklahoma Department of Environmental Quality and the Oklahoma Water Resources Board. The facility is being constructed by Crossland Heavy Contractors of Columbus, Kansas. The first phase of the project is scheduled to be operational in July, 2013. Hennig Enclosure Systems, a division of Hennig Inc., manufactures innovative enclosures and fuel tanks for standby/emergency/prime power/peak shaving generators and switchgear. 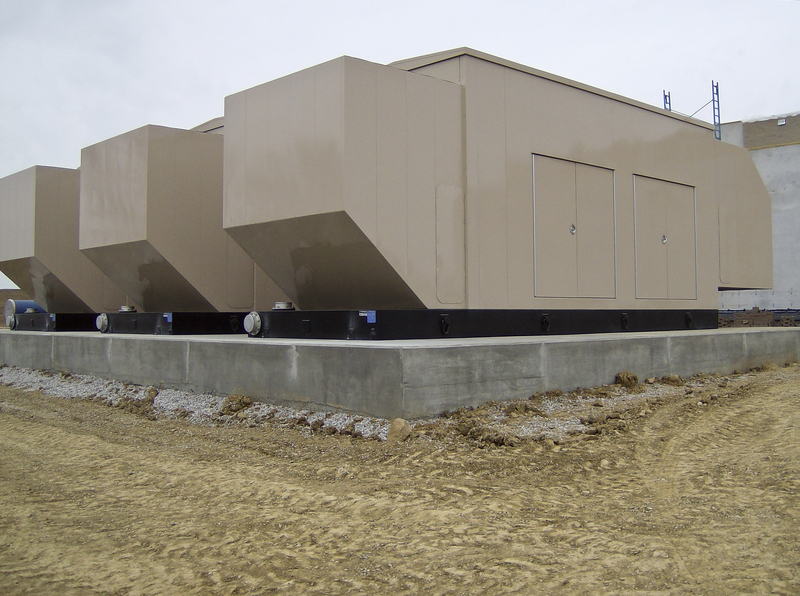 Hennig enclosures are designed and built to provide environmental protection and meet today’s demanding acoustical requirements of power generation equipment. The company operates facilities in Machesney Park, IL. To learn more, visit www.hennig-enclosure-systems.com. Hennig, Inc. designs and produces custom machine protection and chip/coolant management products for state-of-the-art machine tools. Hennig products are designed to protect against corrosion, debris and common workplace contaminants. Manufacturing facilities located in the USA, Germany, France, Brazil, India, Japan, Czech Republic, England and South Korea. Repair centers are located in Machesney Park, IL; Chandler, OK; Livonia, MI; Blue Ash, OH; Mexico City, Mexico; and Saltillo, Mexico. To learn more, visit www.hennigworldwide.com.